Our business started in 2014 from bazaar to bazaar. No we have permanent store at Mal Kelapa Gading. We welcomes you to taste our homemade ice cream on store. 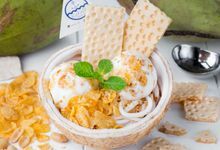 Homemade coconut ice cream served in coconut shell. 100 pax to 1000 pax Please contact us if you need less/more than that. Our product takes the advantages of young coconut, which is one of the natural resources Indo- nesia rich of. 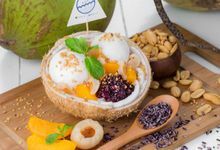 Using of its water incredible properties, we create our coconut based ice cream. We have few range of ice cream avour, namely : vanilla, oreo, green tea, and orange. Then we use the esh of the fruit to enrich the dessert and serve it on the coconut shaved shell. This adds authenticity, aesthetic, and also environment friendly. Kelasi provide catering service to your private event,such as birthday, wedding, family reunions, etc. 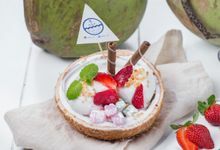 Our journey’s mission is to bring a new experience of enjoying dessert with our unique concept, and to be not only friendly with your budget but also serving the best quality of coco dessert. WE SAIL TO YOUR EVENT !